You know that on-page SEO is very important when it comes to ranking a post higher on Google and any other search engine. Since you need to maintain a lot of things for a blog post in order to maintain its on-page SEO, it’s quite normal that you miss some important tweaks while optimizing your content. For this, you should use an SEO plugin at the time of creating content on WordPress. Yoast SEO is such a nice and powerful SEO plugin that can be used on your WordPress blog and make your SEO content creation process super easy without any mistakes. But many of you may find it difficult to use the plugin properly on your WP blog. To educate you how to use the plugin properly on your site, I’ve written this blog post. So, learn the whole thing right now. How to Use Yoast SEO on WordPress? Now I’ll show you how to use Yoast SEO plugin. The first thing that you’ll have to do is to install the Yoast SEO plugin. Activate the plugin once the installation is complete. You’ll have to complete the best Yoast SEO settings in order to have the full functionalities of the plugin. You’ll see a button “SEO” on your WordPress dashboard after activating Yoast SEO. So you can choose buttons from the list one by one and then save your preferred settings. This is the most important part of using the plugin because if you don’t know how to utilize the plugin, then you could harness the power of Yoast SEO. So learn it well now. You should know that Yoast not only works as an SEO plugin but also does the job of improving readability. Here you see the notifications for SEO and Readability. The plugin shows that my SEO is good and Readability is poor. Why? Because I’ve maintained most of the SEO rules, but I couldn’t manage to write in a readable way because there are some keywords and points left. You’ll see the Readability section is also good when I’ll complete this blog post writing because I’ll take all the necessary actions for making my writing well. At the bottom of the writing board, there are two buttons “Readability” and “Keyword”. Under the buttons, there’s a board for “Snippet preview”. It’ll check whether the titles, permalinks and meta descriptions of your blog posts are okay or not. You see that all the things in my current blog post are quite okay as there is a green color. If any of these weren’t okay, then there would be red or amber colored ribbon so that I could understand there’s something wrong and I’d need to make that okay. The title, the permalink and the meta description of a blog post are measured by the focus keyword. So you’ll have to leave a focus keyword in the box named “Focus Keyword”. You know SEO is all about using keyword properly along with some other things. So keyword usage in an organized way is a key factor for improving on-page SEO. 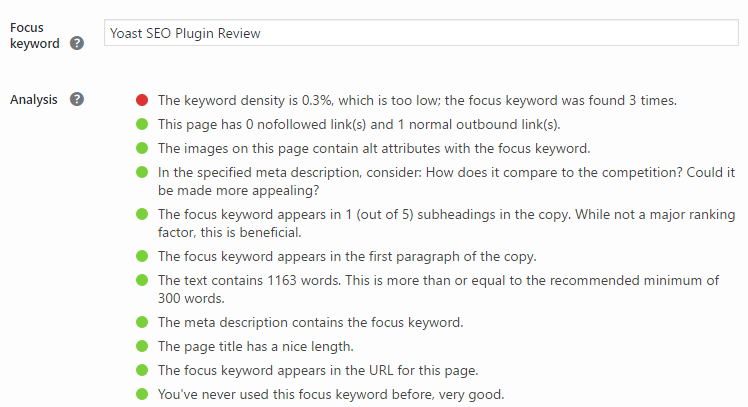 Yoast SEO plugin monitors it perfectly. In addition, this plugin checks other SEO improving factors. You’ll learn a lot of things about SEO if you just read the Yoast SEO’s checklist. So SEO is exactly a mixture of many things. You’ll have to start with the keyword selection to writing the last line of your blog post for maintaining a good SEO format. You’ll have to pick a low competitive keyword though this thing won’t be monitored by Yoast. It’s your task to find out a golden nugget keyword for your blog post. Once you come up with a good keyword, Yoast SEO will do the rest by checking from first to last. You’ll have to write a title that must be a good-length one. Also, you’ll need to use the main keyword in the title. Using the keyword at the beginning of your title, in the permalink and in the first line or paragraph, in the meta description is good for SEO which is monitored well by the Yoast SEO plugin. 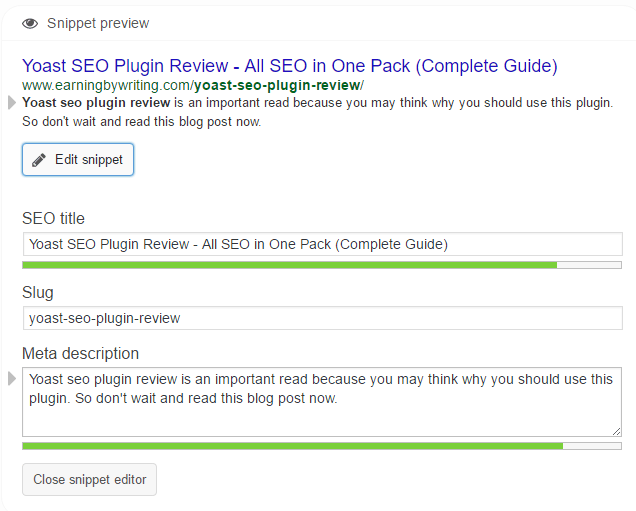 In the Yoast SEO meta description box, you’ll have to write a short description of the blog post. You mustn’t copy some portion of your post and then paste it here. Rather you must write a brief idea about the blog post in the box. Internal and outbound links are quite important for making your post SEO friendly. So if you don’t use them Yoast will catch that and let you know. At an image with the focus keyword in the alt tag is very helpful for better SEO. So this thing will also be notified by the plugin. There are also many other SEO checklists that you’ll come to know at the time of your blog post’s writing. As said before, Yoast SEO plugin also checks the readability of your writing. So you’ll see whether your writing is well-readable or not in the Readability section. Using the same word at the beginning in three consecutive sentences is not good for readability. So if you do this, Yoast will let you know that. I’ve mistakenly done this many times and corrected upon seeing the notification from the plugin. Transition words are very good for taking actions. So, Yoast wants you to use at least 30% of transition words. Yoast SEO also shows you copy score which determines whether your writing is easy to read or not. The copy score is given by the Flesch Reading Ease. Writing a block of texts in paragraphs is not good, so you should write short paragraphs. Also, short sentences are very easy to read. Yoast SEO also recommends that you use passive sentences as fewer as possible because passive sentences are usually hard to be read. Also read: 3 Ways Yoast SEO plugin is making you fool!